My thanks to Clive Best for offering this analysis from Ken Gregory as a repost here at the talkshop. There’s already an active discussion of it on WUWT, but we’ll run it anyway, as its importance is high. OK, it makes the log Y axis run with values increasing upwards, but it turns the atmosphere upside down visually. The paper it refers to backs up Dr. Ferenc Miskolczi’s and Prof. Garth Paltridge’s work. 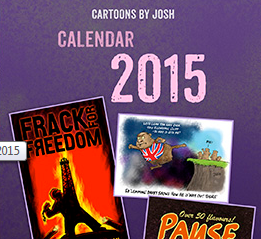 As far as I can tell, it pretty much ends the debate on catastrophic anthropogenic global warming. We still need to see the data from 2001 to 2009 before it becomes a near dead certainty. I believe that CAGW is a dead parrot! This parrot is definitely deceased. This parrot wouldn’t voooom if I put 4000 volts through it. It’s not pining it’s passed on. This parrot is no more! It has ceased to be!! It’s expired and gone to meet its maker. This is a late parrot! It’s a stiff! Bereft of life it rests in peace. If it hadn’t been nailed to the perch it would be pushing up the daisies. Its’ run down the curtain and joined the choir invisible. Well that’s interesting… because a reduction of 0.1 g of water vapour per kg of dry air would yield about 0.2⁰C in (dry air) temperature increase; at the same level of specific heat for the air. i.e. dry air is at a higher temperature for the same amount of heat. Our pleasant planet has a gaseous envelope; gases (including “greenhouse gases”) have “no” surface so they are very poor radiators of heat compared to liquid and solid surfaces; which is why we have a warm atmosphere. Well; substantially warmer than cold space outside of the atmosphere. I discussed the minor topic of psychrometrics at Joanne Nova’s blog. The initial “result” of drier air is that the surface remains “hotter”, radiating more heat directly to space. One of the dirty tricks used with airconditioning systems is to only deal with dry air and to keep it as dry as possible (OH&S be damned). But if you want to cool stuff with air (like computers or expensive machinery), you ramp up the water vapour to between 60% and 80% RH, which provides a much greater specific heat capacity, a lower operating temperature in the same ambient temperature and a substantial “buffer” in case the cooling system fails. There are no significant savings in cooling because you still have to remove the plant heat at the cooling system. 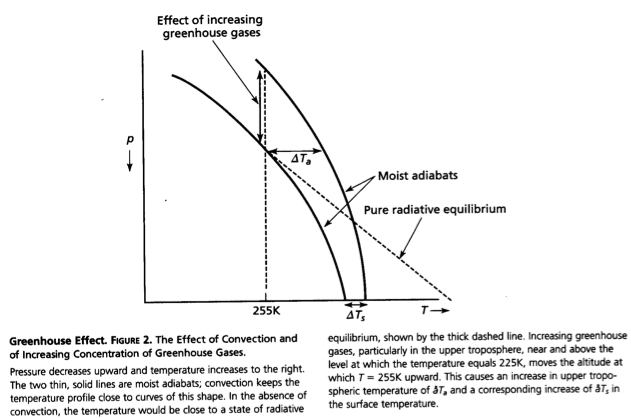 What this demonstrates is that the net “greenhouse” effect is all determined by what happens up above ~6 km in altitude . It doesn’t matter whether CO2 doubles at the surface. The CO2 radiative forcing at the TOA can be offset by relatively small decreases in water vapour increasing radiative losses. The other “known unknown” H2O feedback is clouds. A 2% increase in low clouds would reduce insolation at the surface enough to offset a doubling of CO2. The oldest saying in computing still holds: garbage in, garbage out. Sorry, I just can’t get my head around the conclusion that less water and therefore less cloud makes it colder. I know at night and in the height of winter cloud cover means a bit warmer, but cloud cover on a hot summers day can mean 10-15 degrees colder, especially after a few days in a row. So can you have much more water in the atmosphere without clouds? Although not available yet, it is already understood: the data beyond 2001 has, in somebody’s computer, been added to the program that produced the earlier profiles. It is only the desire to have greater detail and certainty of results that has stopped the new data from being released. If the new data contradicted the older data, that would have been put in a press release. The silence tells you that the new data is not supportive of CAGW. People like Hansen and Gore already know about stuff like this. It is in their career, persona and financial interests to be aware of whatever is happening that might aid or detract from their positions. ACO: Less water vapour at high altitude is the issue here. 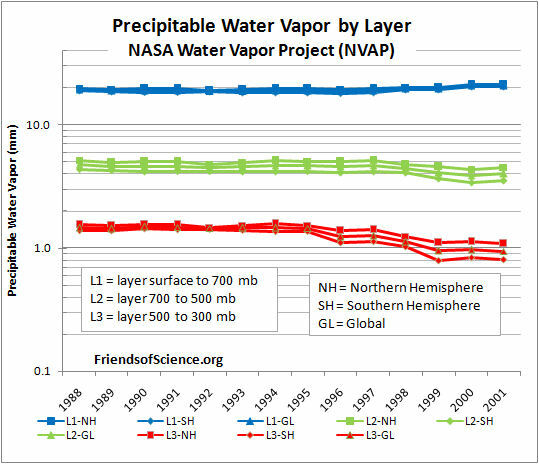 Cloud has been increasing at low level, along with water vapour since 1998 according to the ISCCP and Earthshine Project data. Every day in the tropics water reacts to the daily “forcing” of the sun. Humidity builds up around early afternoon and low convection clouds form often resulting in evening thunderstorms. Why should it be any different to the much smaller and slower forcing caused by a gradual build up in CO2 ? 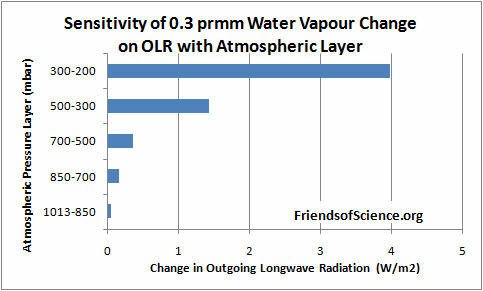 Atmospheric water vapour must allways adjust to maximise heat loss through the atmosphere. That is simply the second law of thermodynamics. Why on Earth wouldn’t it ? It is only capable to do that, if higher moments of atmospheric water vapor distribution are also given (beyond average concentrations). But they are not. 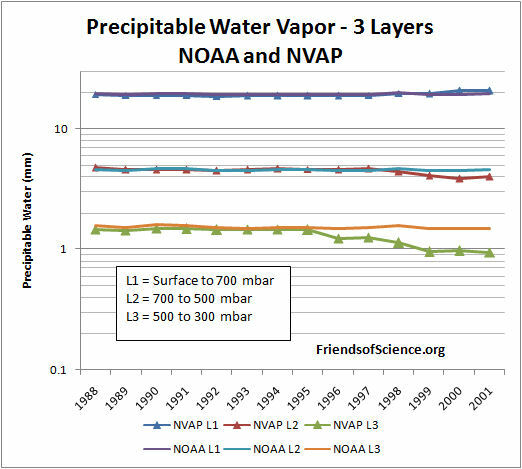 For water vapor is not a well mixed gas. A wire fence is a bit more transparent, than a thin metal plate, even if it contains the same amount of material per unit area, therefore the latter quantity is insufficient to calculate radiative flux to any degree of accuracy in this case. that aerosols are required for cloud formation. 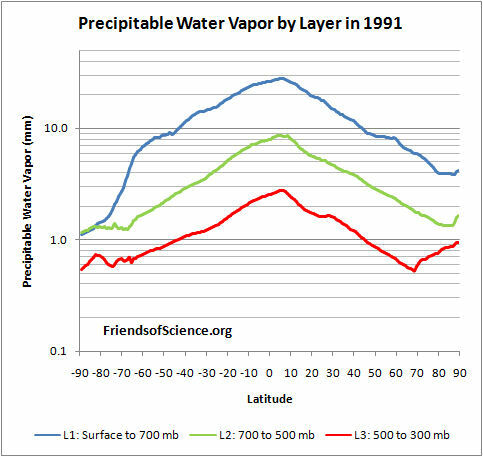 Some types of aerosol are making clouds last longer by suppressing precipitation. Small, more numerous aerosols from combustion processes. Do you think this could increase the percentage of cloud cover sufficient to negate any warming from Co2. Anyway do they really know how much dust (or salt or smoke or gas to particle formation of aerosols) there really is? Or whether aerosols have a warming or cooling effect? I have my doubts as they are very transient but constantly produced! Aerosol effects require better understanding. If Kok’s theory of how dust shatters is correct, he believes that climate models may now be underestimating the amount of silt that is blown into the atmosphere relative to the amount of clay, and therefore underestimating the possible warming effects of a dust storm. For every particle of clay, there may be two to eight times more silt than what these climate models assume,” he said. Could it be that an abundance of the smaller type aerosol (from smoke and combustion processes generally) is creating persistent cloud cover that is suppressing convection and consequently reducing the supply of water vapour to higher altitudes. Less high level warming clouds, more low level cooling, by reflection, clouds. 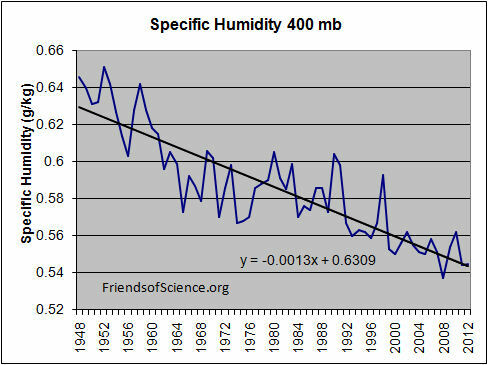 No one has mentioned the possibility that Modtran which is the suppose basis of the claim of radiant heat absorption by CO2 in the atmosphere could be/is giving nonsense results see this http://claesjohnson.blogspot.com.au/2013/03/modtran-one-fly-lifting-20-kilo.html and subsequent posts.. Prof Johnson has made his own assessments, then noted comments from experienced engineers and has gone back to look at historical developments, checked calculations and under laying theory. His has found that there is no experimental proof for any of the claims by so-called climate scientists, and that there has been misinterpretations of measurements eg instruments measure temperature or a temperature comparison -then various calculations convert measured result often incorrectly to something else such as radiant heat which can not be directly measured. Any engineer who has experience with measurements around heat exchange equipment will have satisfied himself that heat can only flow in one direction at a single point of time ie from hot to cold in accordance with the 4th postulate or 2nd law of thermodynamics. Slightly off topic but this http://physicsworld.com/cws/article/news/2013/mar/06/atmospheric-electricity-affects-cloud-height should have general interest for readers of this blog. If true, it begs questions like “what on earth did they do before that?”, “do they bother to include a hydrological cycle?”, and “how could someone credibly claim to model CO2-water feedbacks before seriously trying to model them both individually?”. Yes, and I ’empathise’ with you TB. However, sunspot activity isn’t recognised as a ‘valid’ proxy for the surface temperature that causes RH to force WV into the atmosphere and, subsequently, precipitate. Ray, there are none so blind as the wise monkeys of the IPCC when it comes too recognising the role solar variability plays in climate variation. This is the area where there is genuine culpability it seems to me. They cannot justify the certainty of what they say in the SPM when at the the same tmw thwy admit to a ‘low level of scientific understanding’ of solar effects on upper atmosphere photochamistry. Why after 30 years of intensive research on the climate the level of understanding is still so low is a matter for research funding agencies, faculty heads and cli-sci ‘experts’ to urgently explain and address. Any rays of truth are being obscured by the fog of their own dogma. Or to put it another way, you can’t polish a turd. There is a typo in the sentence above Figure 3. Please change 58.5 to 68.5. We will redo this analysis when the NVAP-M data becomes available. When I refreshed, Tables 1 & 2 are screwed up. I concur (typos translated). Though, that rings more true for the ‘ozone hole’ than ‘total insolation effect’. I think CO2 in the strat may show some ‘mia culpa’ for SH depletion there, but the energy rate to the surface can also mimic this response. How can we distinguish the one from the other? Perhaps this can be shown from the 1st Principles of Psychometry? Oops, darn spell check changed it! That should read “Psychrometry”! 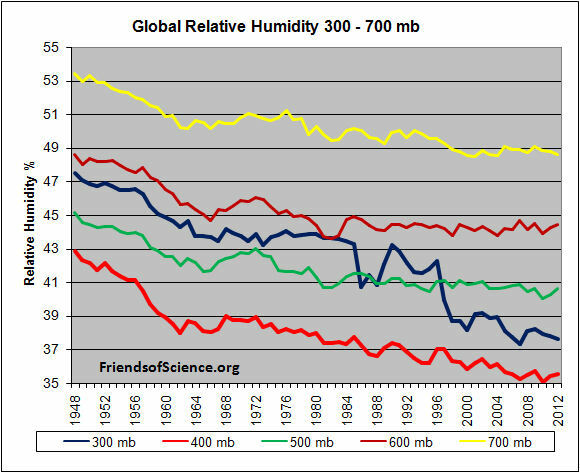 Summary: high altitude drying has cooled the planet far more powerfully than near-surface humidification. Warming seems to reliably cause this effect. The CO2-water positive feedback hypothesis is strongly rejected. 80% of the atmosphere is nitrogen which is very reactive to sunlight(meaning it vibrates like crazy on the planet surface and changes as it cools at night. It becomes more dense in the colder temperatures. Our pressure measuring is off of water and is not sensitive enough to show changes. Sink holes have more pressure which effects evaporation differently. The moon exerts pressure as well but again the measurements are off of water and NOT the actual gases. I suspect that our understanding of gases from the sun is full of garbage as there never have been any actual captured gases but guessing off or radio waves. Pressure difference were not taken into account as denser gases can give a different reading to what is experimented on this planet. In other words…Where does the nitrogen come from? There is only one source that can keep replenishing it. Roy Martin: How do the planets affect the Sun?